So…by now you should probably all be pretty familiar with Russ’s work – since I’ve highlighted him on the blog a few times in the recent past. When I called upon him to help Captain America and I celebrate our wedding week on the blog, he rose to the occasion, and then some! In no time at all I received several pages of writing, and among the words, several of them stood out as ones I would love to have the opportunity to share with you – most of which I did back in September. However, one of the pieces I fell in love with felt like it was better suited to the holidays, so I set it aside for today! As you can imagine, I’m pretty excited to share it with you all, since I’ve been sitting on it for the past three months… But before we jump into it – if you haven’t already started reading and following along with Russ at his site A Grateful Man, I recommend you do so right now (or as soon as you finish reading this post, anyways!) His stories and blog posts will never fail to inspire you to become A Grateful Person, as well. 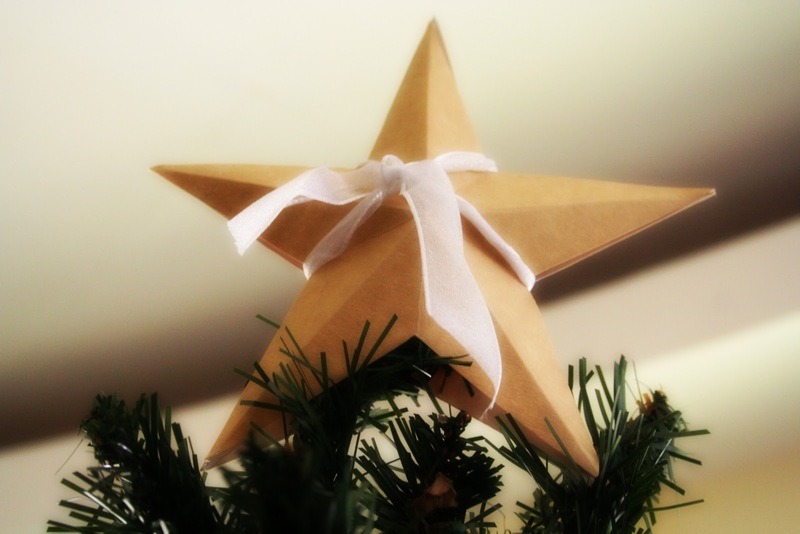 The story of the star that sits atop our tree goes back over thirty years. I was a young single man whose business was failing. Finances were very tight. I had enough money to buy a Christmas tree but not enough for ornaments or other decorations. A young woman who I was dating at the time saw how bare the tree looked. She made a big star out of a piece of cardboard that she’d cut out herself and then wrapped in aluminum foil that she taped to it. It sure looked good on top of my nearly-bare tree! A year later that young woman became my wife. That star has sat in the place of honor on every Christmas tree we’ve had for over thirty years. During all the good years it reminds us of times when things weren’t so good, and during rough years it reminds us that bad times don’t last forever. But most of all, it reminds us as to how blessed we are to have the love of our family and friends. Over the years the star became ragged-looking and has often been repaired by adding still more aluminum foil and tape. My wife sometimes suggests that we replace it with a store-bought tree-top ornament, but I can’t bring myself to do it, because that star—-and now that most unusual Christmas tree that so proudly holds it up—-are powerful reminders of the wonderful acts of love that to me embody the true Spirit of Christmas. No star in all the heavens is more beautiful to me than the one that sits atop our tree. Do you or your family have a favorite holiday decoration or ornament? Click Here to check out all of Russ’s Guest Posts and Contributions to The Hand-Written Life. Interested in submitting a contribution or writing a guest post for The Hand-Written Life? Click here to get featured! I’m currently looking for posts on the New Year – What it means to you, resolutions, and more! However, submissions for a variety of topics are still both accepted and appreciated. Thank you, Andrea. I’m grateful for all the ways you brighten my life. I already am blessed by Russ’s posts and I love this story so very much! Merry Christmas Andrea, Captain America, Russ and Mrs. Russ!